Army Specialist Robert Joseph Allen grew up in a military family, and followed the family tradition when he enlisted during his early 20s. He served for three years, including a deployment to Iraq with the Army’s 4th Stryker Brigade, 2nd Infantry Division. After returning stateside, he lived with his wife and their two sons while stationed in Washington. Two years later — on August 2, 2012 — he committed suicide. That year saw the highest rate of active-duty military suicides ever recorded — more soldiers died from suicide than combat. His mother, Cathy Sprigg, sat down with StoryCorps in Tampa, Florida to remember him. 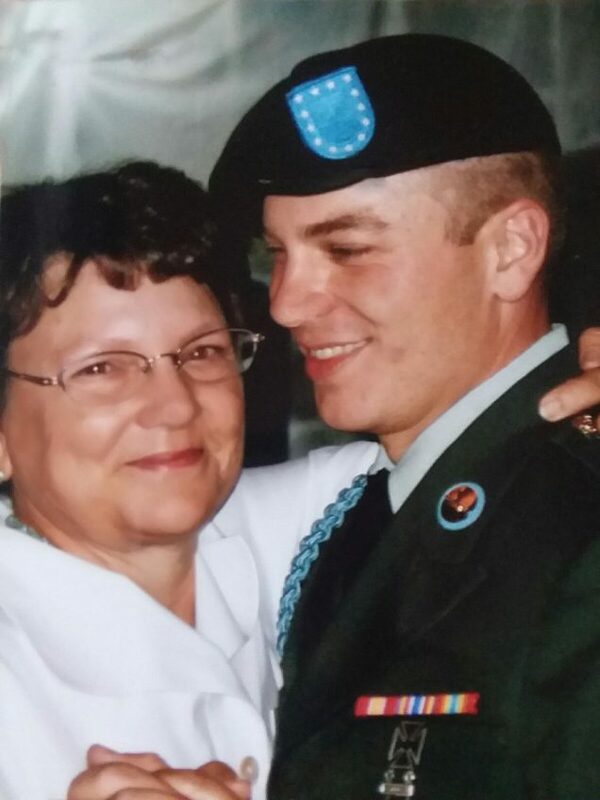 Top photo: Cathy Sprigg with her son, Army Specialist Robert Joseph Allen, at Tampa International Airport in 2010. Allen was headed back to Iraq after being on leave for the birth of his son. Courtesy of Cathy Sprigg. Bottom photo: Cathy Sprigg and her son, Army Specialist Robert Joseph Allen, dancing at his wedding in 2009. Courtesy of Cathy Sprigg. Originally aired May 26, 2018, on NPR’s Weekend Edition Saturday. CS: He was a happy-go-lucky kid. When he was in tee-ball, one time he hit the ball, went to second base, and then turned around and said, ’Mom, I made half of a home run.’ That was kind of how he looked at life — his cup half-full. He always wanted to be in the military, even back then; I mean, we’d pass a convoy and he’d just go nuts. So when he was 24, he enlisted and then was sent to Iraq for a year. And he told me some stories, but he said, ’There’s a lot of stories that I can’t tell you, Mom.’ He didn’t sleep well; he had nightmares. And that twinkle in his eye was gone. He took his life August 2, 2012. And, you know, as a mother, when your child’s heart is full of joy, your heart’s full of joy. And knowing what a dark place he must have been to do this is almost more than I could bear. You know and hindsight is 20/20 but, when he got back from Iraq, he got off the plane, and I thanked God that he made it home safe. I didn’t realize that he didn’t. And, um, I feel like he’s not looked at as a hero because his wounds weren’t immediate and they weren’t physical. And, aside from losing my son, that’s probably one of the most painful things.